Just casually waiting to cross the road…In.My.New.Trench. At first, I wasn't sure… It kinda' drowned me… With my 'petite' frame I've alway been more of a 'fitted' gal and now, I have all this fabric… It's quite possibly an accident waiting to happen but still, I love it! I've been gagging for the temperature to drop a teeny bit (so gonna' regret that come November..) so that I could get it on!! 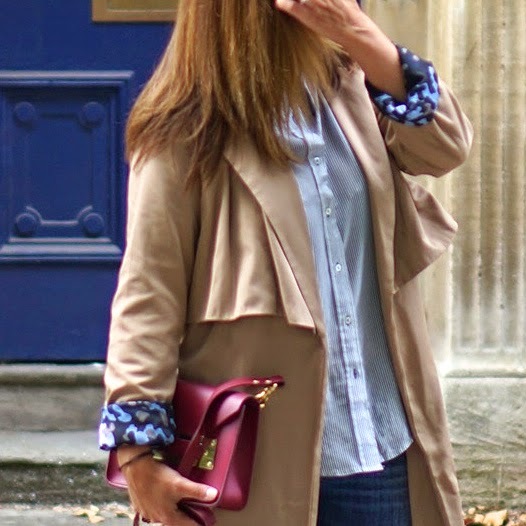 I love the lining of this trench… blue camo, why not?! See the full Today I'm Wearing post here. Trench, buy here and check out the gorgeous grey Topshop one here // Jeans, similar here // Shirt new from Zara, similar here // Heels are DvF from The Outnet, and some absolute stunners here (WANT) // Sophie Hulme Mini Envelope, similar here (in a stunning colour!!) // Sunnies from ASOS, buy here. Have you invested in a trench? Do you have one that you dig out year after year? Deffo your best pics EVER!! Love the jeans..Can I ask where the ones you are wearing are from pls?